서울은 1949년 서울특별시로 개칭된 이래 행정구역에 많은 변화를 겪게 된다. 1943년에 종로구, 중구, 동대문구, 용산구, 성동구, 영등포구, 서대문구의 7개 구가 설치된 이후에 18개의 구가 더 추가되어 1995년에 25개 구, 522개의 행정동을 갖는 행정구역이 형성되었다. 그 이후에도 행정동의 설치, 폐지로 인해 2010년 기준 서울시의 행정구역은 25개 자치구와 424개의 행정동이 되었다. 행정동은 행정의 편의를 위해 설정한 행정구역으로서 주민 수의 증감에 따라 수시로 설치 또는 폐지되어 왔다. 2012년에는 종로구 명륜3가동이 혜화동에 편입되어 행정동의 수는 423개가 되었다. 법정동은 법률로 정해진 행정구역으로 주로 예로부터 전해온 고유 지명을 명칭으로 하고 있으며 행정동에 비해 거의 변동이 없다. 2010년 서울시의 법정동은 467개가 있다. Ever since it was renamed to Seoul Metropolitan Government in 1949, Seoul underwent many changes in its administrative districts. To the 7 original districts, 18 other districts were further added to the city in 1995, placing the total count of administrative districts at 25. 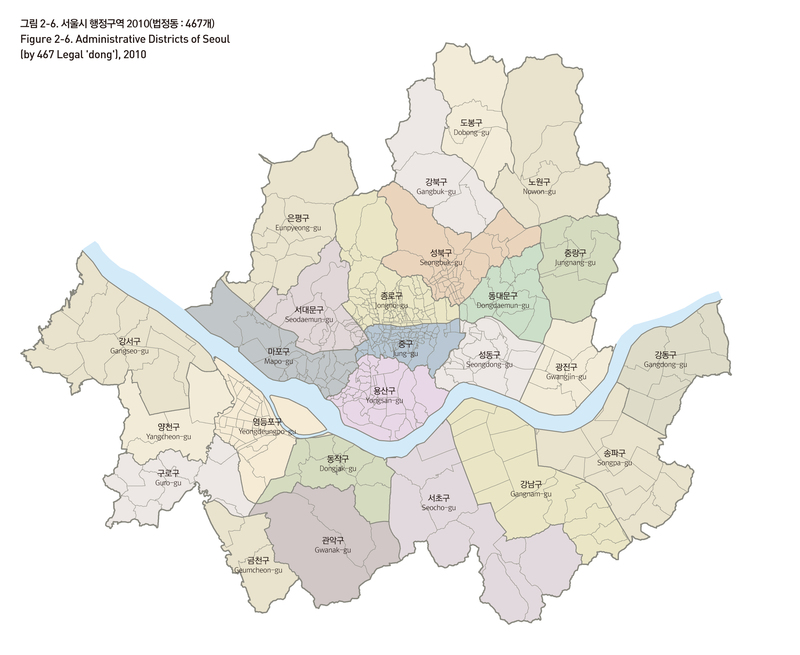 With the installment and discontinuance of certain administrative neighborhoods, there are now, as of 2010, 25 districts and 424 administrative neighborhoods in Seoul. Administrative neighborhoods (dong) are units designated for administrative convenience and have always come and gone with the growth and decline of local populations. Legal neighborhoods (dong), however, rarely undergo changes in their status. 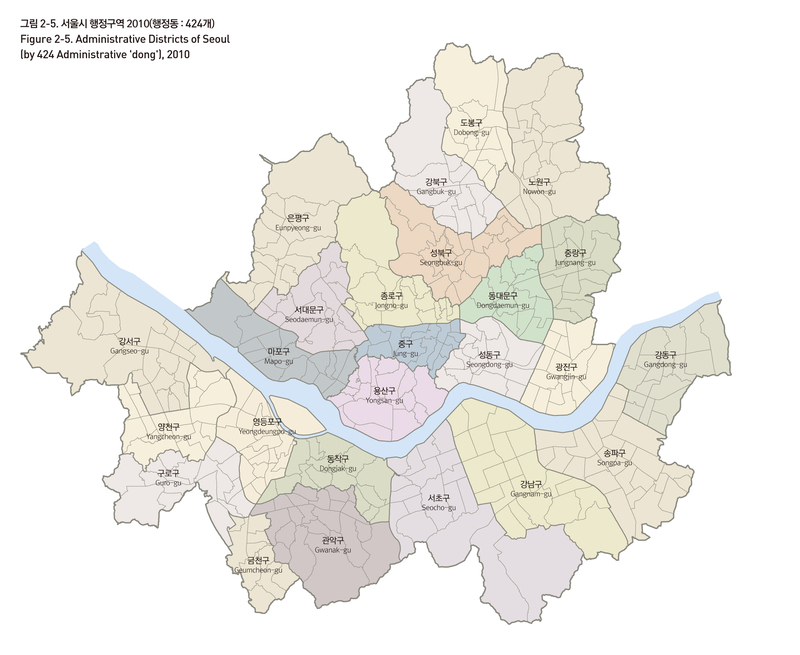 As of 2010, there are 467 legal neighborhoods in Seoul.